What’s good for the for the goose is good for the gander. Right? Well, we have local climate change critics charging our NIWA scientists with fraudulent manipulation of temperature data. 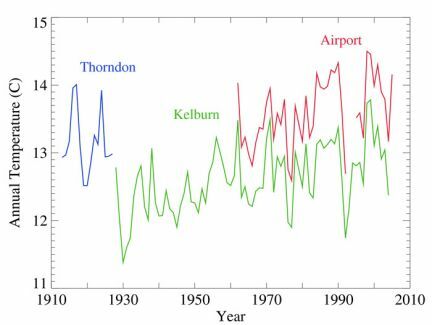 They question the scientists’ presentation of the temperature changes over time in New Zealand. They even demand the right to scrutinise minute details of this science. So let’s be fair and demand the same transparency from these critics. I have asked them some specific questions and the answers I got show it is the critics’ “science” which is faulty. Some might even say fraudulent. The critics’ analysis of New Zealand temperature data was unscientific. And their “research paper” criticising NIWA scientists was not even checked by a scientifically competent reviewer who would have picked up their mistakes. “Are we feeling warmer yet?“ was prepared by the NZ Climate Science Coalition and the NZ Climate Conversation group. It describes itself as a “paper” resulting from “a combined research project” undertaken by the two groups. New Zealand Climate Data Shows Clear Evidence Of Fraud. CLIMATEGATE – A better study than NIWA, by an 11 year old! Maybe these climate critics will claim they are not responsible for the tone of these newspaper and blog headlines and content? You be the judge! 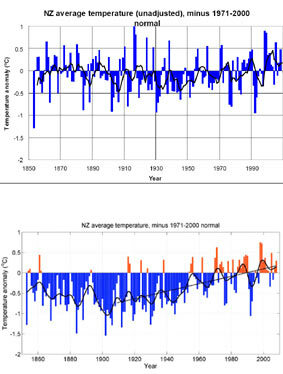 The “paper” includes these figures claiming to show NZ temperature readings actually show no warming (top) – hugely different to the “official graph” from NIWA (bottom). The “paper” claims that scientists “created a warming effect where none existed.” That “the shocking truth is that the oldest readings were cranked way down and later readings artificially lifted to give a false impression of warming.” And “we have discovered that the warming in New Zealand over the past 156 years was indeed man-made, but it had nothing to do with emission of CO2 – it was created by man-made adjustments of the temperature. It’s a disgrace. Strong claims indeed. And damaging, even slanderous, ones. The unnamed authors of this “research paper” acknowledge that the climate scientists had adjusted, or corrected, the raw data – but pretend to be ignorant of the reasons for this. Even claiming (wrongly as it turned out) that NIWA would not explain the adjustments. Hard to believe because they do refer to the problem of combining data from different meteorological stations and sites – if only to claim adjustments for site effects are not necessary. They declared “the station histories are unremarkable. There are no reasons for any large corrections.” (My emphasis). But they also make a scientific claim that corrections were not necessary – without any supporting evidence or even any indication that they had attempted to establish if corrections were necessary. Richard Treadgold (convener of the Climate Conversation group) collated the “research paper” and kindly answered my questions on the scientific analysis used and the degree of scientific checking of the “paper.” I am thankful to Richard for his rapid and helpful replies. Was any statistical analysis (eg. analysis of variance) done on the raw data to test for the effect of station site? If so could you please send me a copy of the output? What scientific input did you have for the report? Was there any review process for the report? 1: No! (and therefore 2: irrelevant). How can one combine data in the way they did without first checking if this was valid? Even worse – they made a bald assertion that there were no sign of site effects – without checking. Without any evidence. This is a dreadful mistake, even though the research was not done by scientifically competent people. A simple statistical analysis would have revealed any site effects and therefore the necessity of correcting the raw data when they were combined. Even simpler – site effects would have been revealed by simple plots of the data from different stations. This is demonstrated by the data for the three Wellington stations in the figure. Richard’s groups were wrong to combine data without checking for site effects. They had no basis for their claim that adjustments were unnecessary. Their graph included in the “research paper” is faulty. Their conclusion of no warming in New Zealand is incorrect. Their “research” distorted the temperature data, did not include even the most rudimentary analysis of the data for site effects, and the “research paper” had no competent scientific input or review. And the “paper” then goes on to attack the integrity of respected NZ scientists , virtually accusing them of scientific fraud! The lack of review or scientific checking is also shocking. After all, they are making accusations against scientists whose output is routinely reviewed. How can the critics claim any credibility if they are not prepared to expose their claims to the same level of checking? It’s hard to hit a moving target. They avoid any discussion of their own scientific failures by continuing to attack NIWA’s work. Their attacks are usually of the “when are you going to stop beating your wife” type. They continually charge NIWA with not making data available, or not describing methodology. They paint a picture of defensive and evasive researchers. And any response from NIWA is met with new demands. The goal posts are always on the move. Their demand for justification of data adjustments moves on to demands for detailed methodology used in the adjustments. Then questions about the number of stations included. Now on to questions about urban warming effects. And so on (haven’t yet checked todays new demand). They aren’t interested in the answers of course – after all they could get these from publicly available data and published papers and reports. They just want to create an impression that NIWA is guilty of fraud, and is being evasive and deceptive. Why produce a “research paper” without any scientific input? Why do they believe scientific expertise was “not required” for this project? Why did they release their “paper” as a press release via a well know conspiracy theorist? This entry was posted in belief, Environment and Ecology, New Zealand, science and tagged Add new tag, climate change, climategate, Data, deniergate, Environment, global warming, New Zealand, Public records. Bookmark the permalink. I was wondering if there is any explanation as to why the pre-movement of the weather station data (pre-1928) was also lowered in the final graph? It would seem to me that that data would be unaffected data, as it was taken at sea level before the station was moved to a higher elevation. Of course, all data from that point on should have been base-lined with the original sea-level measurements—According to NIWA the adjustment was about 0.8 C. Wouldn’t that only affect the data AFTER 1928? Also, where is the adjustment for the heat-island effect for the NIWA graph? 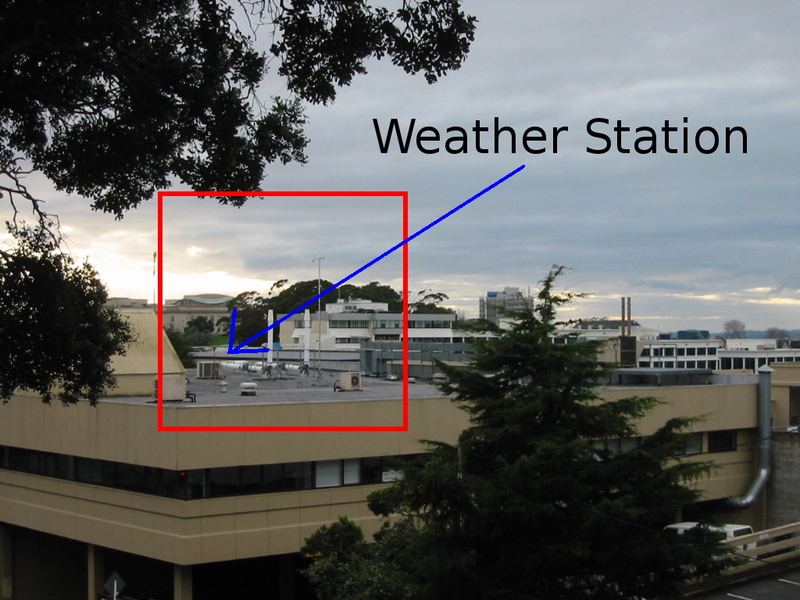 After all, the site of the post 1928 station (mentioned by NIWA and touted as the reason why the climate deniers’ graph is wrong) is sitting right next to an air-conditioning unit. Seems to me, that throws both the Climate Deniers’ and the Climate Humpers’ graphs both in the “fantasy” category. 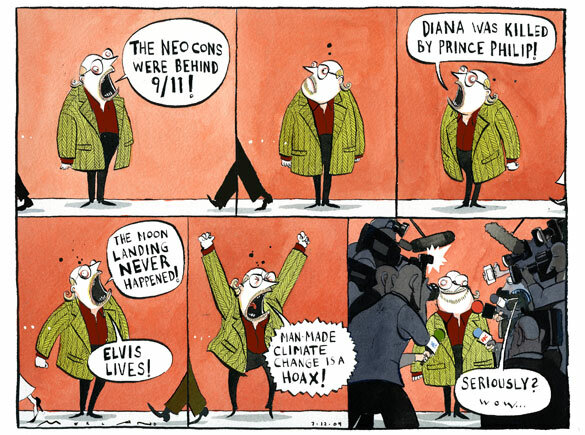 An explanation from the Deniers and Humpers would be most welcomed. I still find it interesting that people think that building was built in 1928. Briefly; that’s not the weather station, and funnily enough, a high vantage point in the world’s windiest city has no appreciable UHI effect. You have apparently attempted to make some mileage off the claim that the authors of the paper said things “without checking.” Technically this is libel on your part. As you know, their defence after the response to their paper was that in fact they submitted multiple requests to NIWA for information on adjustments. They were able to state when they did this last and they were even able to name the NIWA scientist that they made their query to (and that scientist has not denied that they did in fact make their request). It is unfair to say that they did not check. It is not up to them to explain NIWA’s shyness. If you could specifically pick out a claim in the article “Climategate: How the Scientific Community is Responding,” which was a description of how “alarmists” and “deniers” are responding to the events surrounding the recent attention on climate change data. Given that each and every claim I made in that blog post was a documented one, I’m interested in which of the claims I made was slanderous. Unfortunately, you appear to know diddeley-squat about the NZ defamation laws; in particular, that the truth is a complete defence, as is also an honesty held opinion. Even more cogent is the fact that Treadgold ‘s comments are in the political realm, where the defence of qualified privilege applies (have you forgotten Lange vs. Atkinson?). I suggest you do some homework before you try to put the frighteners on anyone else. What on earth are you talking about? I wasn’t suggesting legal action if that’s what you’re trying to insinuate, Rob. But for what it’s worth, the truth doesn’t apply here (or I would never have raised the issue in the first place), an whether a belief is reasonably held isn’t going to be settled by a person saying “I reasonably hold this view.” Gosh, your assessment of how much I know about defemation law turned out to be misplaced. As for your silly innuendo about “frightners,” I give it the attention it deserves. None. Ken’s a big boy. He can explain himself (in theory, at least). Clearly, you do not bother to read your own posts. You have accused Ken of two counts of libel, presumably to try to exert a chilling effect. Glenn – your didn’t read the post did you? I was not making “claims” about the authors of the “research paper”. I was quoting from Richard Treadgold’s replies to my specific questions. It has nothing to do with “multiple requests” on their part or the fact that NIWA have given details of when they supplied information. Not to mention the published data and methodology. It’s to do with the fact that they (the critics of the science) combined data incorrectly. And that made claims about adjustments not being necessary – but had done absolutely nothing to check the accuracy of the assumption. And here I mean their own check – a simple statistical test for sources of variance or a plot of the data for different stations would have shown them their method was faulty. I thought I had explained that in my post. The word “check” in my post and my questions to Richard refer to the normal checking (review) commercial and scientific organizations and institutes do of a report or “research paper” before publication. Richard admits that no competent scientific checking was done. He claims it was not necessary for any of their statements! In effect, their postilion has nothing to do with NIWA. They (the critics of the science) used publicly available data, ignored published information on methodology and then went ahead and combined data using a method which any simple analysis would show was faulty. You are trying to divert discussion away from the responsibility and culpability of these organisations for their own “mistakes.” And applying the “when are you going to stop beating your wife” and “moving target” tactics. (As well as defending by attack). You know, they may have prevented these problems if they had a bit of scientific input and checking (review). I’ll check out the specific post of yours you mention when I get time (I am out of town at the moment). However, I notice you don’t refer to your post “Climate scientists caught lying” which I think is more to the point. In this discussion your arguments and their tone has always been that the scientists are wrong, lying, devious and evasive. You have never paid any attention to the facts of the original “research paper” and its dissemination as a press release by conspiracy theorist Ian Wishart. In fact you have helped promote the “research paper” and its fallacious contents. OK, confirmation bias – but it puts you on very shaky ground, credibility-wise. doctorbulldog. What relevance has this to do with anything in my post? This is was purely about the mistakes made by the critics of the science. Great post, Ken. I love the cartoon too. I’d like to encourage readers here to actually read what Ken is criticising and see for themselves if he is accurately sumarising it. What is your point Madeleine? Or are you suggesting that my characterisation of your posts was inaccurate? I stand by both of them. The “paper” did not have scientific input or review – Richard admitted that. Another of the Sciblogs blogs has now come out showing where that paper had very poor scientific input (see Peer Review for the Climate “Science” Coalition.). Specifically, some statistical analysis of the data shows the coalition’s approach to be faulty. I have also been in touch with one of the scientifically qualified people in the coalition to get his take on this little fiasco of theirs. I can’t see how any half way scientifically competent person can accept that report’s conclusions. Your posts have cooperated in the irrational attacks on our NIWA scientists. For sure. Or are you also going to back down on this? Do you now accept that the Coalitions attacks on NIWA scientists were unwarranted? Heh, David’s analysis is brilliant. More so given he couldn’t even get the -0.7°C trend the C”S”C claim when doing regression of the unadjusted data set. Which points pretty strongly that whoever is responsible for that -0.7°C trend is committing exactly what the C”S”C accuse NIWA of doing, namely fraud. Ken, my research into the NIWA controversy hit a wall when I got to the “internationally accepted methods” of adjusting surface-measurement readings. At that point, I decided there may be no resolution to the “yes you did/no you didn’t” nature of this debate. I haven’t tried to take this any further since. Today, however, I see that Russia has weighed in on the general topic of surface temperature measurements. Moscow’s Institute of Economic Analysis (IEA) makes some startling claims about the CRU’s use of Russian data. If true, this confirms the WORST claims of the “Climategate” crowd, and supports the suspicion that NIWA’s “internationally accepted” methods are suspect. “The HadCRUT database includes specific stations providing shorter observations and incomplete data highlighting the warming process, rather than stations providing longer and uninterrupted observations not demonstrating significant warming. On the whole, HadCRUT specialists use the incomplete findings of meteorological stations far more often than those providing complete observations. IEA analysts found that the climatologists used the data of stations located in large populated centers that are influenced by the “urban heat effect” more frequently than the unbiased data from the stations located in less populated places. “The IEA authors calculated that the scale of actual warming for the Russian territory in 1877-1998 was probably exaggerated by 0.64°C. Since Russia accounts for 12.5% of the world’s land mass, such an exaggeration for Russia alone should have an impact on the IPCC claim that the global temperature in the last century has risen by 0.76°C. Ken, you keep asking me to comment on the NIWA issue. I’ve been saying the same thing over and over, but I’ll say it one more time. As far as I can tell, the NZ Climate Science Coalition and the NZ Climate Conversation group began with an obvious and appropriate question: How do the reported figures for NZ overall temperature compare to the raw data? They computed the “raw” averages and published it in their report, with a small amount of commentary. To the best of my knowledge, NIWA responded by saying the “raw” data had been adjusted according to generally-accepted principles. That raises the broader question of what those generally-accepted principles are. I don’t think that question will be resolved by digging deeper into this spat between NIWA and the local critics. Read my post, Scott. I quote the claims made by the denier groups. How do you respond to those claims. I think it is quite clear that it was scientifically inept to combine the data the way these groups did – without adjustments! Do you agree – or not? They didn’t “compute” raw averages – the combined raw data from different sites without applying appropriate adjustments for site effects. In fact they claim there were no significant site effects (demonstratively not true) and they did this without checking. How can you support such rubbish? Well, Ken, I looked at the NIWA control panel long enough to see how to access the raw data. If I had downloaded the temperature data and put it together, I would have come up with something more or less like the “amateurs” at the NZ Climate Science Coalition and the NZ Climate Conversation group. In the absence of more information, I would have been pretty skeptical of the difference between a simple reconstruction of the raw data and what NIWA reports. So far, I haven’t found any source that explains what methods and principles NIWA uses to “stitch together” different sets of surface temperature measurements. Do you know whether NIWA documents how they adjust temperatures? So – you are incapable of evaluating that “research paper.” You are purposely distracted by NIWA and you refuse to evaluate thedenier claims about the data or about how it should be treated. You are not in a position to evaluate NIWA’s work ore comment on it (unless you have access to and read their reports and papers). But you are in a postion to evaluate the deniers “research paper.” Yet you refuse to. Unless you do that you have absolutely no credibility in any discussion of issues arising from it. As I said – an interesting social psychology issue. Ken, the “research paper” is easy to evaluate. It’s easy to recreate–you just pull the raw data from the NIWA site and average the readings. I’ve been off looking at the Climate Coalition side of the story. As far as I can tell, the more I look into this, the more I come back to my initial conclusion. The NZCC wants to know exactly how NIWA adjusted temperatures, and NIWA is giving examples but not rules. Both sides are increasingly certain that they are in the right. I don’t expect this “debate” to change any time soon. I’m not sure why you see my discussion of NIWA’s adjustment methods as “wife beating.” As far as I can tell, NIWA’s adjustment methods are the only thing that are under discussion. NZCC questions why NIWA bases its report on seven sites, and (as far as I can tell) suggests that uninterrupted readings at an airport might be compromised by the urban heat island effect. I am sure NIWA is following generally-accepted principles in using the airport data, but I can understand why NZCC would question it. (1) Is Scott incapable of evaluating the “research paper”? Not incapable. It seems to be a straightforward averaging of raw data, plus a set of questions about WHY NIWA chose the data it did, plus some attacks on NIWA’s credibility. I wouldn’t call it a piece of high-quality science, but it’s well within the bounds of public disccussion. (2) Is Scott “purposely distracted by NIWA”? To be honest, I don’t know what “purposely distracted” means. I do want to know WHY NIWA chose the sites they did, and I’d like to know the rules they follow in making temperature adjustments. (3) Does Scott “refuse to evaluate the denier claims”? First, I limit the term “denier” to a fairly small group of people. Second, the “denier claims” in this case are that an average of the raw data fails to show a warming trend. That, in and of itself, seems to be true. The central “claim,” as far as I can tell, is this: “The shocking truth is that the oldest readings have been cranked way down and later readings artificially lifted to give a false impression of warming, as documented below.” I guess the only part of this that is a claim is that the impression that results is “false.” That, in my opinion, goes back to what (for me) is the central question to be addressed: what ARE the methods NIWA uses to select sites and/or adjust temperatures? (4) Does Scott want to “distract away from this ‘research paper'”? I don’t think so. I’m actually trying to discuss the central issue in dispute: how does one create a long-term surface measurement dataset from multiple measurement stations? (5) Is the “urban heat island” a “wife-beating issue”? I don’t think so. If NIWA has selected seven sites to base its long-term temperature reconstruction on, and one or more of those are possibly affected by an urban heat island, then NIWA’s choices deserve some scrutiny–which NZCC seems to be more than willing to provide. (6) Is Scott in a position to evaluate NIWA’s work? No, I don’t think so. I haven’t claimed to be. I don’t want to be. I don’t think I’ve said ANYTHING that could be construed as critical of NIWA in anything I’ve said. (7) Is Scott in a position to evaluate the NZCC “research paper.” I think we’re repeating ourselves here, but, YES, I am, and it seems like they want to know what methods NIWA uses to “stitch together” different sets of measurement data. Ken, maybe you mean something else by the term “evaluate the deniers ‘research paper. '” As I’ve said before, I have the raw data and could do my OWN number-crunching exercise. I’d probably get pretty much the same results that NZCC did, although I might phrase my findings differently. If I did completely reconstruct the NZCC paper, I’d probably wind up about where they seem to be right now–wondering about the “generally-accepted principles” of selecting sites and merging data. As for my personal credibility–since when have I said ANYTHING in this (or related) threads that depended on “my credibility”? I’ve been trying to understand the science! You are confronted with the climate data for NZ from the database. Obviously you can plot data for individual stations as in my figure for the Wellington stations. Before you go any further you have to ask – is it permissible/acceptable to just combine data without making site adjustments. Any half scientifically competent person then tests for site effects. Richard Treadgold admitted they made not test for these. Yet they assumed there were no site effects!! So can you honestly accept their statement: “the station histories are unremarkable. There are no reasons for any large corrections.”? Just have a look at the figure for the wellington sations and try to tell me there are no site effects. I’m sure you’re sincere, but I really don’t understand your position. I’ve spent several weeks trying not to get involved in the NIWA/NZCC dispute. You keep telling me to address it. When I DID try to address it, I came to the conclusion that both sides believed they were in the right (which is not an unusual situation). My “assessment” or “evaluation” of the NZCC “research paper” keeps coming back to the same point: it appears to me that NZCC wants to know exactly how and why NIWA chose the sites it did and made the adjustments it did. I’m happy to see that NIWA has promised Rodney Hide that they will post the full methodology for their adjustments on their website. In my opinion, that should be more than enough to end the big NIWA/NZCC flap. You are a hypocrite, Scott. Ken, I genuinely enjoy the discussion here, but I can see that I’m not adding to the experience. I wish you all the best. Live long and prosper! There are other effects than the over-stated UHI effects on temperature. Primarily, altitude. This one is quite simple; you go up, and the air pressure (and hence temperature) drops quite predictably, speaking of averages. AIUI this is the main reasoning behind the choice of the airport as a similar area to the Thorndon site. Simple application of Bohr’s law. There are no doubt other environmental factors more significant than UHI; proximity to the ocean, terrain effects, etc. Sam – this article is not about NIWA directly but about the “research paper” produced by the Coalition and Conversation group. Any diversion onto heat islands, details of NIWA adjustments only diverts attention away from the real issue (this is what Scott was continually trying to do). I am sure I could have a great debate with the NIWA scientists about details of adjustments. And differences arising in the debate may produce small differences in results – more likely not. But the real mistake is the use of the raw data by the denier groups, that they stated that no site effect were present, that they did this despite not even simple checking, and that they then went ahead and combined the data without accommodating site effects. This is a huge scientific distortion and they should respond to these criticisms before they can make any charges against NIWA. I’ve had a casual glance through this very long thread since you brought it to my attention. I should correct one mistake I saw: we published our study to our two web sites (CSC and CCG), accompanied by a media release to news agencies and Scoop. Ian Wishart subsequently picked it up for himself. So we did not “use” Ian to release our study, nor was it our suggestion that he do that, though we are delighted that he helped to publicise it. You might be interested in our response to NIWA, which we posted last Friday at http://www.climateconversation.wordshine.co.nz/2009/12/18/niwas-obfuscation-unequivocal-its-worse-than-we-thought/. It contains our clear refutation of NIWA’s main point, that for several years the CSC has had the information it is now asking for. It also shows how NIWA are refusing to answer or even to address our actual questions. We had delayed our response while we waited for NIWA to answer us through official channels in the Parliament. It became obvious they were determined to obstruct us, hence Monday’s official request under the Official Information Act. We cannot accept their refusal to disclose the data we want, whatever the reasons are, but the longer they refuse the more suspicious they appear. What are they hiding? Richard – it’s interesting that you see the only mistake is in my reference to use of Wishart to release the document. Of course that may be wrong in details – (but I would love to see the mail correspondence between your organisations and Wishart!). Yet you don’t face up to the elephant in the room. The proven falseness of your claims about there being no site effects and the charges made against NIWA scientists. Even your scientist member Vincent Gray has acknowledged that these claims slipped past him when he approved the “paper” and he should have picked them up. So why don’t you and your organisations “bite the bullet” and admit to these mistakes. (Otherwise we can only assume they were intentional – not “mistakes”). Refusal to acknowledge these claims were wrong destroys any credibility to your subsequent “demands” being made of NIWA about disclosure of data. They are revealed as typical expression of “Gish Gallop” – a common technique used by creationists in attacking evolutionary science. Shifting the goalpost instead of justifying of withdrawing the original claims. And of course you will move on the new manufactured demands, whatever NIWA’s reaction. Your aren’t a “creationist with a thermometer,” are you? Yes, it’s a shocking piece of hypocrisy from the NZCSC, isn’t it? Whatever data is put on line they will always demand something else. Here they demand “the original worksheets and/or computer records used for the calculations” – it’s getting a bit like the backs of envelopes and scraps of filter paper used to jot down notes and calculations. Of course institutes don’t hold on to the information. When we went over to computers all the data from our field trials were transferred – and the paper records scrapped. The required adjustments to the raw data will have been outlined in the published papers and reports. If one really wants to check that out – go to the raw data and work it out for yourself. In other words – the data required to support the site adjustments – is in the data itself. And that is available – has been for a long time. Of course, the NZCSC is not at all interested in validating the science (they don’t have the expertise) or “peer reviewing” it. Their intention is to discredit it. That is why even though they admitted to me in emails that they had made a fundamental “mistake” with their own report they continue to repeat the lies. I think it’s about time I released extracts from the emails I have from them. A bit of deniergate exposure is due to them. This will show how hypocritical they are. Ken, you may be right about NZCSC doing what we Americans would call “moving the goalposts,” but I must admit that I would have been a lot happier with NIWA if they could have shown how and why they made their adjustments. Without that, all we have is raw data that shows no warming trend and NIWA’s word that some sort of “adjustments” do produce a warming trend. Do you suppose NIWA could go back to their raw data at this point and construct a new “open source” adjustment methodology? Yes (I basically think Monbiot has got it right). Scientists discuss these sorts of issues all the time. But can you recognise the true scandal? You seem preocupied with irresponsible charges of wife beating and ignore the realities of practical science, and the realities of political forces attempting to discredit humanity’s great scientific endeavours. Scott your claim “all we have is raw data that shows no warming trend and NIWA’s word that some sort of “adjustments” do produce a warming trend” is irresponsible. it’s just not true. Have a look at Adjustment of temperature and rainfall records for site changes. I’m a big fan of Monbiot. I’ve followed his work for some time now. He’s the kind of person that give investigative journalism a good name (for a change). …people are in denial not only about the science of climate change but also about manipulation and deception by other climate change deniers. They stoutly ignore far graver evidence of falsification and fabrication by their own side, even when there is smoking gun evidence that their champions have secretly taken money from fossil fuel companies to make false claims. They make no attempt to hold each other to account or to sustain any standards of truth at all. The vast body of climate science still shows that manmade climate change is real and that it presents a massive challenge to human survival. Monboit’s interviews and videos are also worth a look. Then there’s the absolutely appalling “debate” that Monbiot had with David Bellamy. (For those of you who don’t know, David Bellamy was a big-name environmentalist and biologist that hosted several TV shows on the BBC. Incidently, David Bellamy is one of the founding members of the NZ Climate Science Coalition. That’s the same band that issued spurious press releases attacking NIWA. Then there’s Monboit’s coverage of the Royal Society getting royally pissed off with Exxon and asking them to “cease and desist” waging a multi-million dollor public disinformation campaign. Royal Society says to CEI: Cease and desist your lies! Check out the rest on part 2 and part 3. Watch Plimer wriggle and squirm. Ken, thanks for that link. The abstract is encouraging–wish I could read the full article. My biggest concern with station siting is the “urban heat island” problem. That wouldn’t affect rainfall records, just temperature–and, as it turns out, not maximum temperature. Man-made structures seem to increase the amount of heat absorbed during the day, which leads to elevated MINIMUM temperatures but not elevated MAXIMUM temperatures. So, if I could read the article you reference, I’d be looking to see whether they match minimum temperatures or not. I note that the authors of the study you cited (Rhoades and Salinger, 1992) did a later study that notes the asymmetry of minimum and maximum temperatures in 2000. My biggest concern with station siting is the “urban heat island” problem. Could the scientists at Nasa, the National academy of science, the American Meteorological Society, and every professional scientific organization on the planet really have been so silly as to miss something this obvious? The “Urban Heat Island” PRATT. Ummmm… Cedric, I don’t know if you’ve been following the news lately, but the Urban Heat Island problem is an issue again. Fred Pearce (an AGW believer) is a journalist at the Guardian (a left-leaning paper in the UK) has written a series of hard-hitting articles that show how serious this problem is. … the Urban Heat Island problem is an issue again. No it’s not. It never really was an “issue”. The matter became a brain-dead zombie talking point years ago. It is and has been for a very long time…a PRATT! AGW is not a religion. Stop trying to paint it as one. NASA is not a cult. …how serious this problem is. The Urban Heat Island PRATT is not a problem; serious or otherwise. Thank you. I have now read them. As I suspected, they don’t have anything to do with what you are talking about. The “Urban Heat Island Effect” does not rest upon 42 Chinese weather monitoring stations. …may yet result in a significant revision of a scientific paper that is still cited by the UN’s top climate science body. A scientific paper. That’s “a scientific paper”. The “Urban Heat Island Effect” does not rest upon one single paper. Get a little perspective on the issue. Do you have even the slighted clue on how many papers on global warming are published in peer-reviewed journals every year? [They] are being accused of scientific fraud by an independent British researcher over the contents of a research paper back in 1990. So we have two scientists who are in hot water over possibly being sloppy with their work and not doing the right thing about it. If it’s all true then good riddance to bad rubbish. Let them be duely named and shamed and their paper used as toilet paper. HOWEVER, two scientists and a single paper written 20 years ago are neither here nor there in the grand scheme of things. Always read an article in full. Right up to and including the conclusion. It helps to avoid confusion. Seriously Scott, you swallow whales and strain at gnats. You interested in some current, up-to-date research? Something that’s peer-reviewed that looks hard at the “Urban Heat Island Effect”? Read the article and click the paper available on pdf. Issues like the “urban heat island effect” are of course not beyond the understanding of the specialist scientists who have worked in this area. It just seems to very childish and arrogant that current climate change deniers are raising this issue as if they have only just discovered it? They should have a bit of humility and recognise that it is very unlikely they will discover anything like this outside of their areas of expertise and actually think about crediting the scientists with some respect in these matters. The double hypocrisy of this heat island effect is that our local deniers in their attacks on NIWA are raising it as an issue – photos and all. On the one had they are trying to discredit NIWA scientists by claiming that this effect was ignored (no evidence presented). On the other had they are demanding that NIWA should not make adjustments for effects like this. This later assertion (that there is no reason to make adjustments) was the basis of their original report. Vincent Gray has admitted this was a mistake. But they haven’t retracted it and now repeat the assertion. Gray himself has publicly (in a local conspiracy theory forum) repeated the report’s assertion as if he has forgotten his acknowledgment that it was mistaken). But then again they are not interested in truth – just in discrediting science. Vincent Gray has admitted this was a mistake. Didn’t recognise the name at first. Yet I felt confident that he would fit the classic profile. 1) He’d be a non-climatologist. 2) He’d be no spring chicken. So I did a google search and guess what I found? Vincent R. Gray (born 1922, London) is a New Zealand-based coal chemist, climate author, and founder of the New Zealand Climate Science Coalition. Not exactly my first choice if I want to find out about climatology. Sure, everybody has an opinion but…this guy isn’t qualified to give it. Then there’s him being eighty-eight years old. Now there’s nothing wrong with getting on in years but there really does seem to be an overpreponderance of quite old people on the denialist side. Seriously, how much active, cutting edge research is it reasonable to expect from him at his age? How many octogenerians are ritually given as authorities by climate deniers in arguments? Just off the top of my head, I can name three. Fred Singer-eighty six years old. Joanne Simpson-eighty seven years old. John Theon-exact age unknown but well over seventy and most likely in his eighties. So how many of the climate deniers are in their autumn years? Is there a pattern or…is it just a false perception? I also noticed this about science spokespeople in the denier movement – their age. Commented on this here Beware the retired scientist? Should have given you the hat-tip. I must have read your article, followed the link, copied it and filed it away…and then proceeded to forget who originally brought it to my attention. No problem. I am flattered that I may have helped with the link. I was aware that Vincent Gray had retired but didn’t realise his age. The local deniers promote him as their expert which shows some poverty of imagination. He appeared to forget that he had acknowledged to me that they made a mistake on claiming no site effects. He had also forgotten that NIWA had sent him information on this several years ago while his organizations were accusing NIWA of lying. Cedric, thanks for the link to the Menne, et al (2009) paper. It’s very helpful. Sorry–I see it’s Menne, et al (2010). Cedric, thanks for the link to the Menne, et al (2009) paper. If you ever get the time, please check out the videos too. They really do a good job of cutting through the fog of the fossil fuel industry disinformation campaign. I’m going to post my current thoughts on the global warming question over at my own site–I don’t want to clutter up this old thread on Ken’s site with a whole new round of discussion. This editorial from the UK’s Guardian is noteworthy. After a series of solid investigative articles, the paper has now moved from the “warmist” camp to a position qualified skepticism. <i.After a series of solid investigative articles, the paper has now moved from the “warmist” camp to a position qualified skepticism. There has been no “move” from one position to another. Read what they themselves wrote. Indeed, the settled core of our knowledge on climate – the fact of increasing atmospheric carbon, the rising temperature trend, and the heat-trapping mechanism linking the two – has acquired the terrific authority it now possesses precisely because it has been forced to withstand so many challenges in the past. The moment climatology is sheltered from dispute, its force begins to wane. The well-financed interests that are set to pay a heavy price from any curbing of emissions will do anything to discredit those uncovering facts that they would rather keep buried. Their arguments will get a sympathetic hearing from a public whose understanding can be distorted by the desire for an easy life. Complacency is tough stuff to puncture; only the purest strain of truth can be relied on to do the job. “China Daily” carries this report from a “warmist” who went to Copenhagen and came back with concerns. How on Earth do you know that Li Xing is a “warmist”? Credulous journalist would be more apt. But I was impressed by the presentation of Dr Fred Singer, an atmospheric physicist and founding director of the US Weather Satellite Service, who challenged the IPCC findings with his research data. Impressed by Singer of all people? Singer hasn’t done any scientific research in years. The man’s eight-five years old for goodness sake! Director of the US Weather Satellite Service? Well yes, he was. Almost fifty years ago. You could have included with your comment on India, for example, that there is a huge climate change conference going on there now at which the IPCC and it’s chairman have been given warm support by government leaders. Things are always more complicated than these little links and quotes indicate. They are an extremely poor substitute for discussion. Not really for comment even. Surely this is not the way you think? Like Twitter? A one-sided twitter? This week’s flurry of news doesn’t disprove AGW, but it may be enough to force some dramatic changes at IPCC. Sorry–I posted the Times Online link before I read your comment, Ken. I’ve been posting links to significant headlines in papers that have tended to be “warmist” because I think they are newsworthy. I haven’t been adding extended comments because this is an OLD thread. Scott, that’s like saying you are trying to build a science/anti-science coalition. One side listens to NASA. There is no “common ground”. Offering any kind of solution is pointless when the deniers won’t even recognise that there is a problem. If you really want to help, then start by killing PRATT’s when you see them. Prick holes in the disinformation bubble that poisons the blogosphere. Undo a bit of the bad work done by the George C. Marshall Institute. Scott – this is a bit disingenuous, isn’t it? Why replace fossil fuels if there is no reason to? You have consistently argued to undermine the science that indicates we have a problem – so why suddenly attempt to solve a problem that you believe doesn’t exist? Why – do promote fast-tracking of nuclear power plants! That is you agenda. It’s got nothing to do with the science of climate change at all. It seems to me that you are attempting to subvert the normal regulations and safety procedures and using climate change as the excuse. There is a real problem with putting all one’s eggs in one basket, of promoting a one-horse agenda. Nuclear power can surely mitigate the problem of fossil carbon. But, it can’t by itself produce the necessary solution. According to the IPCC work on mitigation, nuclear power could be increased from 16% to 18% of the energy mix if there were a doubling of nuclear generation globally by 2030.! Our solutions will come from taking a multi-pronged approach to the problem. Not by a blinkered, industry driven, approach. Cedric, you might recall that James Madison’s brilliant contribution to the history of government was a system where continuously shifting coalitions came together to accomplish their goals. I’ve seen Baptists join with the ACLU to enact federal legislation. I don’t see any reason why “warmists” and “skeptics” can’t work together. There is EVERY reason to replace fossil fuels, and as quickly as possible! We don’t need AGW to give us a reason to replace them. We already have soot, smog, acid rain, and terrorist threats to our energy supply. Add to that the fact that the US pays $200,000 per minute for foreign oil and you’ve got every reason you need to build a replacement. As for “using climate change as an excuse” to subvert the normal regulations and safety procedures–you can’t have it both ways. Here’s my bottom line. Is it your considered opinion that AGW is enough of a threat to justify a massive transformation of the global economy? If so, do you believe the “warmists” have the political “muscle” necessary to force this kind of change in time to save the planet? If you believe that change is URGENTLY NEEDED but people are too stupid to adopt the “top-down” approach Al Gore suggests, why not have an open mind and consider a viable alternative? I don’t see any reason why “warmists” and “skeptics” can’t work together. One group listens to the scientists. The other group thinks it’s all a “sekrit konspiracy”. Focus on the problem rather that going off half-cocked on one policy or another.